We are a cohousing community of 19 modest private houses and a common house built on three acres of a 9.5 acre property, with one-quarter mile frontage on the Esopus, a deep-water creek, between the falls over Barclay's Dam and the Hudson River. Our uniquely lovely property is the largest in the village, offering the convenience of town living and a nice degree of privacy. We worked long and hard to achieve our success, and in so doing came to know each other as trusted partners. We're all delighted to be living here! We have homes for sale in the community for new members. 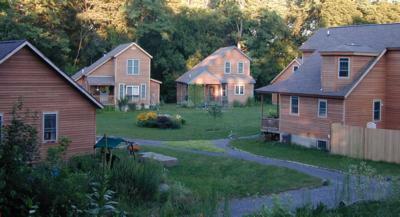 Cohousing embodies an ideology of sharing, balanced with respect for privacy. We are egalitarian, tolerant, and open to alternative lifestyles. Only a few of us are vegetarians, but any food preferences may be accommodated at community meals (cook's choice). See our Facebook page for more pictures and for a flavor of life in the community. Note: Our page on the National Cohousing Assoc. website has partial details and our page on the FIC website page has all the details.